HQ Trivia show host Scott Rogowsky has left the show amid growing troubles at the quiz company. 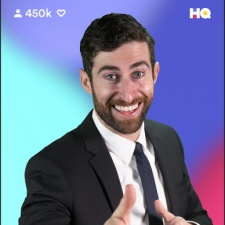 Rogowsky leaves his place as the face of HQ Trivia to take up a new gig hosting Major League Baseball show ChangeUp. “Nothing in my decade-plus entertainment career has meant more to me personally and professionally than my involvement with HQ,” Rogowsky told TMZ. While a fan favourite, Rogowsky was said to have had a rocky relationship with Intermedia Labs CEO Rus Yusupov. The HQ boss allegedly threatened to fire Rogowsky in 2017 if The Daily Beast ran an unauthorised interview with the host. Rogowsky’s departure comes amidst reported turmoil at Intermedia. According to TechCrunch, workers at the firm have grown increasingly tired of Yusupov. The studio boss regained the interim executive position after the death of Colin Kroll, and the report claims he has been repeatedly accused of poor leadership. One source told TechCrunch he is“extremely manipulative in an unproductive way” and “a dude who just cares a lot about his reputation”. The outlet reported that in February, 20 of the company’s 35-strong staff signed a petition to remove Yusupov, concerned about the company’s short-term lifespan, Two sources claimed the firm burned through $1 million a month, with early investors are reluctant cough up more funds. While the unsuccessful petition led to two firings it looks like Yusupov has accepted that his replacement is coming, according to new board member Tinder CEO Elie Seidman.